At the small but scrumptious Yale University Art Gallery works by John Baldessari and Hieronymous Bosch hang within 200 (horizontal) feet of each other. A few hundred feet further, in the similarly rather scrumptious New Haven Green, sits Occupy New Haven. 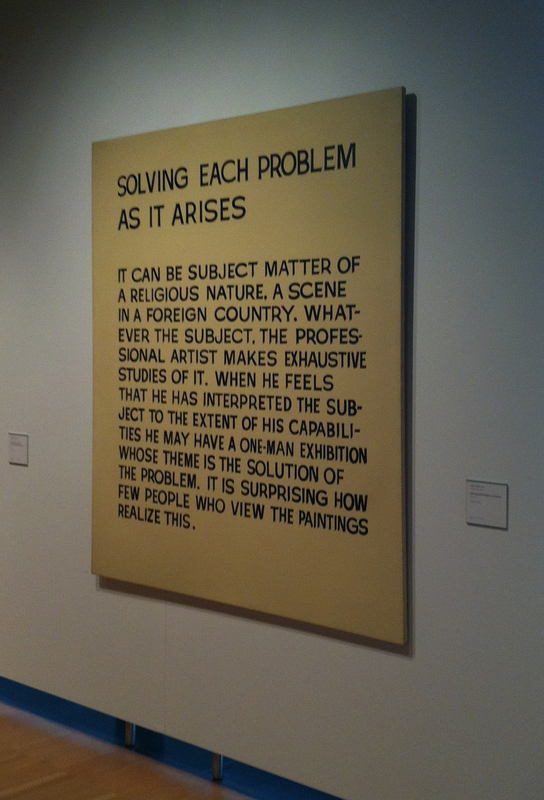 The Baldessari piece is a text heavy painting called Solving Each Problem As It Arises (1967). When I was at the Gallery there was a tour group from New Jersey (identifiable via bus logo and accents) hating on a nearby Basquiat but oblivious to the painterly and conceptual complexities of the Baldessari. “. . . When he feels that he has interpreted the subject to the extent of his capabilities he may have a one-man exhibition whose theme is the solution of the problem.” Baldessari writes. The people at Occupy New Haven are still trying to articulate the problem (at least in it’s more subtle nuances) but they have some very clear starting points. It’s essentially an age old issue, the subject of the meta-work of which the Bosch panel in New Haven is a part. The piece at Yale is titled Allegory of Intemperance (ca. 1495–1500); another section of the now-dismantled triptych depicts Gluttony, aka Greed. 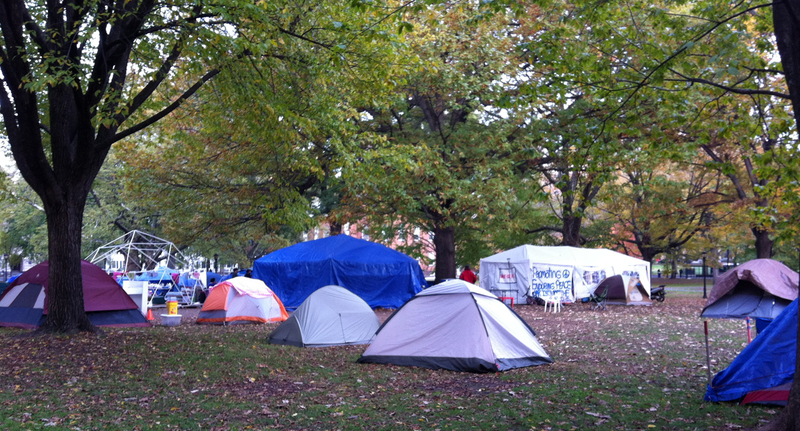 There’s a surprising grace and solemnity to the Occupy New Haven encampment. The Green is a perfect spot for such civic engagement. Tents sit beneath the outspread boughs of coloring trees with plenty of space left for cogitation (or more tents). It’s like a Quaker meeting or a vast quiet installation: a more organic version of a Walter de la Maria installation, perhaps, less the thunder. But maybe one day that too will come.